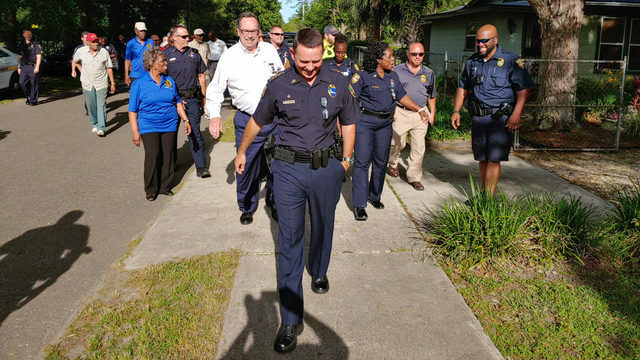 JACKSONVILLE, Fla. - Jaguars fans got a look Thursday at what the team has in store for next season, including more changes inside the stadium and long-term plans for a major development of the Shipyards property and beyond near the stadium. Jaguars owner Shad Khan, President Mark Lamping and Executive Vice President of Football Operations Tom Coughlin each shared their vision for the future at the annual Jaguars State of the Franchise, some points which have been a long time in the making. "All of the major things that we announced today were things that we've been working on for years," Lamping said. "We're really fortunate as we have made these huge investments in the facilities and added infrastructure. Now the team is performing well and we're in a position to take full advantage of that." The focus, at least in the near-term, for development around the stadium has shifted from the Shipyards to development of Lot J, to the southwest of the stadium. "We want to focus on what we can control and really work with the other parties to make that happen," Khan said. "We are going to be driving forward because I think this is absolutely paramount for the Jaguars to be stable in this area. The city has to grow and we have to have the energy around the stadium and in the stadium especially on game day." The financial health of the franchise, new Jaguars uniforms, the announcement that Jacksonville's own Lynyrd Skynyrd will headline its final concert on Labor Day weekend at the stadium and the future downtown development were all discussed in the 90-minute presentation. Lamping also announced that there would be modifications to the north end zone and the addition of a dog park inside the stadium. Details of a major residential, commercial, hotel development with marina proposed for the sports complex, including the Shipyards and Lot J, were also provided. The most anticipated part of the 90-minute presentation was the unveiling of the new uniforms. The new Nike Vapor Untouchable uniforms feature three jersey options (black, white, teal), three pants options (black, white, teal) and two sock options (standard, color rush teal). The Jaguars’ new helmets feature a high-gloss black paint, with “JAX” on the front 3D bumper to honor the city of Jacksonville. On the rear of the new helmet, the white bumper will feature “JAGUARS” in teal lettering. This teal font will match the teal numbering directly above the bumper. 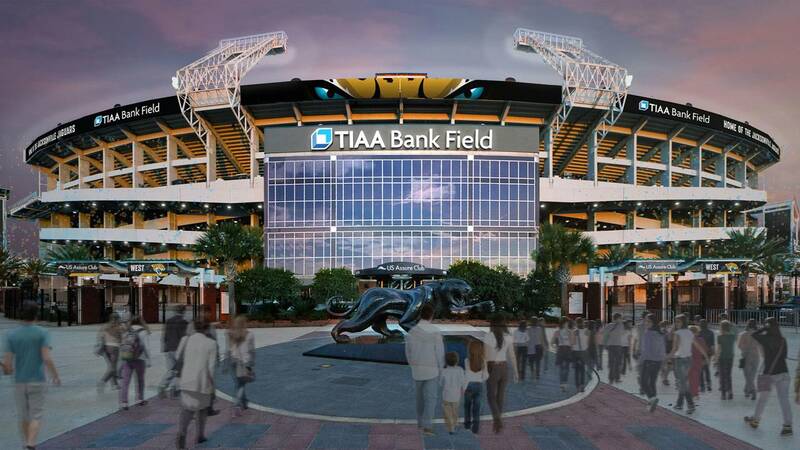 The Jaguars also showed mock-ups of the new signage for the newly approved stadium name, TIAA Bank Field.